Last month in Ludwigshafen, Germany, was the world known tarmac hill climb, Haldenhof Revival. All sorts of cars and drivers from around the world come to Ludwigshafen to see whos got the skills and balls of a tarmac hill climb. Ruf made an appearance with their eRuf this year. 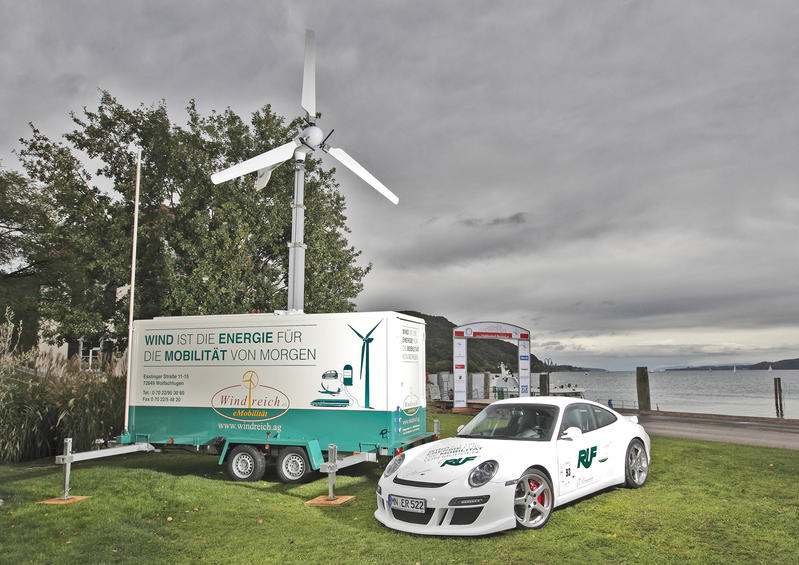 There was a catch though, the all electric Porsche gets its power from a trailered wind turbine that stores wind power in a 20 foot long enclosed trailer. The four feet in diameter rotor can be raised up to ten meters to catch wind if needed. Its a mobile power station! Ruf has been at the forefront of electric Porsche’s. In October 2008, RUF presented it’s electric automobile: the eRUF. In March 2009 presented another spectacular electric prototype at the Geneva motor show. This prototype was developed in cooperation with Siemens Corporate Technology. The power output is 270 kW (367 bhp) and offers phenomenal torque of over 900 Nm. Acceleration 0 – 100 km/h is 5 seconds, maximum speed is 250 km/h. Now in the future I can see these charging stations in the back of cars....no trunks though. And have the rotor on top of the cars to always be charging the cars batteries. It's not gonna look good at first, but if there is a will, there is a way.